Looking for an online Hypnobirthing course that’s plain and easy to understand, yet highly effective? The Hypnobirthing Course Manual with CDs and Mp3s is your step-by-step guide to natural, pain-free birth. Created and developed by Kathryn Clark, a certified clinical hypnotherapist, this full birth preparation course will reveal all the tools and knowledge you need to have a relaxed, safe and anxiety-free birth. 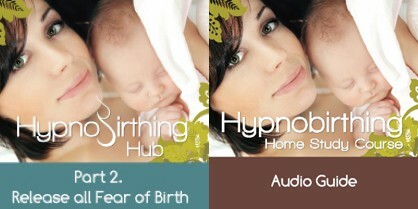 Be fully prepared for the best birth experience with the Hypnobirthing Home Study Course . This comprehensive birth preparation guide will reveal secrets, tips and techniques that don’t require you to attend any other Hypnobirthing or birth preparation class. Tagged as the best Hypnobirthing course by happy and fulfilled mothers who have read the manual and listened to the CDs and MP3s, our Hypnobirthing home study course covers natural birthing, alternative options and the best medical interventions. No matter what path your birth takes, you will be fully prepared, relaxed, confident and empowered. Without leaving the comforts of your home, you can easily learn how to have a fulfilling, with little to no pain birth. This 15-hour hypnobirth home study gives you the best chance at having the anxiety-free birth you’ve heard so much about. Filled with practical techniques that stem from both personal and professional experience, you will soon gain the confidence and look forward to a serene birth that you are in control of. What’s Included in the Hypnobirthing Home Study Course? During this journey, you will find yourself equipped with the tools that allow you to visualize a serene birthing experience. Each album uses soothing music that’s conducive for learning with interwoven messages, placing you in a complete state of relaxation. It’s so relaxing and relatively easy – you can even listen to the Hypnobirthing Mp3s/CD albums as you drift off to sleep. It is easy and quick to learn, and in no time at all you have fully prepared for your amazing birth. The course is designed for you to complete a unit over the space of a week, yet there is total flexibility on how long you choose to start and finish this full birth preparation course. It only takes 15 hours to be fully prepared for an easy, comfortable birth. Most clients are curious to know how much an online Hypnobirthing course can cost, as compared to the Home Study Course. A Hypnobirthing class can cost around US$500, and often the materials are only taught in class and available for future reference. Valuable information is quickly lost and so good birthing outcomes are often lower. Easy to read and follow, with clear summaries, effective exercises, video techniques and more. At the end of each unit, you’re also able to track if you’re progressing. We are confident that our Hypnobirthing Home Study Course is far better, and more effective than a standard online Hypnobirthing class. What Will I Learn in the Five Units? An examination of the difference between the natural, calm births of animals compared to the chaotic birthing process women go through. We learn how to prepare our bodies for birth so that it is simpler, calmer and quicker. Learn how powerful your mind is and how it can be used to create positive or negative results. Discover how to build and sustain positivity in both your visions and your actions. Here we will create the birth picture you most desire down to the minute details that will make the picture real. A completely relaxed body is the key to a comfortable birth. Discover the deep relaxation triggers, breathing techniques and visualization methods that will enable you to stay in complete control of your comfort levels. This section also gives partners the tools to confidently and calmly support you. You will find out about the way in which your body was designed to give birth and how medical intervention impacts this. Should you need to make a decision regarding change in your birthing plan, you will know the very best option for you and your baby thanks to this section. You are completely guided through every step of your birth and are now confident, knowing the full hypnobirthing tools and techniques to make your birth empowering, fulfilling, safe, calm and comfortable. READY TO START YOUR AMAZING BIRTH JOURNEY?